So don’t expect it to. 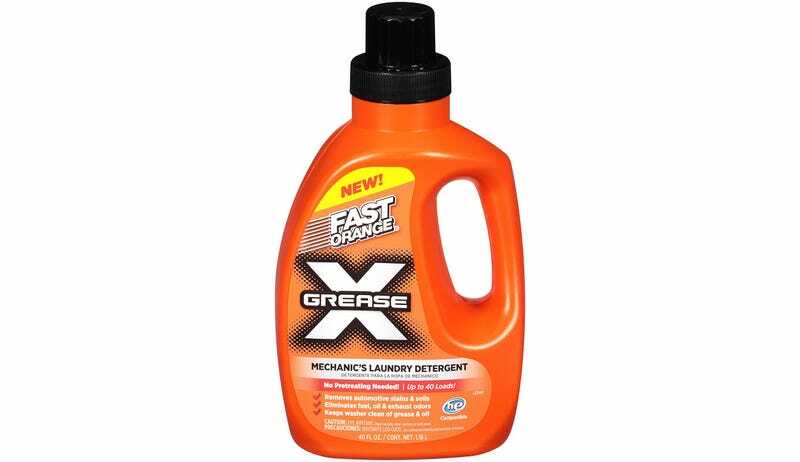 I decided to try this stuff out on my grungy wrenching clothes, and here’s what I found. In case you’re wondering, it does not contain any sort of gritty stuff like the pumice-powered hand cleaner does. The instructions call for the bottle to be shaken well before use, but there doesn’t appear to be anything separated that would require re-mixing. It’s a slightly yellow liquid with a pleasant citrus smell. The only visible difference after shaking is a bunch of tiny, suspended air bubbles. Now I’m not in the habit of buying dedicated wrenching clothes. Instead, my grungies are composed of regular clothes that have outlived their presentableness. Any time I get a hole in my jeans, or a shirt gets too stained to recover, it goes with my wrenching threads. This T-shirt is among the worst of the bunch, so I selected it as my main before-and-after item to show you guys. Unfortunately, there’s hardly any difference. After two washes (including a pretreat) with this stuff, it’s (maybe?) a little lighter. It is clean, but I’m afraid the stains are here to stay. Now to be fair, these clothes have been through the wash many times before I picked up this new detergent. So they’ve had time to saturate the fabric permanently. I’ll admit, I’m a little disappointed, but hey, these are my wrenching grungies; returning them to normal service isn’t all that important to me. Besides, this probably wasn’t a fair test to begin with. This stuff might still stand a chance against freshly-stained spots, but miracles are not its forte.